This Build a Birthday stamp set is so much fun! I can see me getting lots of use out of this one. 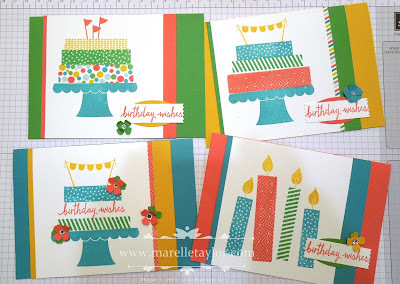 I'm always needing birthday cards, and this set suits birthdays of all ages. I've gone with a bright and happy colour combo - Bermuda Bay, Cucumber Crush, Crushed Curry and Watermelon Wonder. I created most of my birthday cakes with stamps, but one is made out of washi tape. TIP: Attaching your washi tape to wax paper first makes it easier to cut it to the right length.